Remember the Lemmings? Those tiny, adorable things that you had to guide through levels? Well, Spirits by Spaces of Play utilizes the same gameplay format, only in different ways. As you can see from the trailer (below), Spirits puts us in controls of some adorable (and slightly creepy) forest spirits, which we have to march through levels, leading them to portals. Gameplay wise, the basics are identical to a Lemmings way. When the levels starts, we get a specific amount of spirits. These spirits can do only one thing on their own, walk forward. We have to get a set amount of them through the portal. Moreover, in some stages there are also flowers that we can get, which we do by having a spirit walk over them. Controlling the spirits is simple. By left clicking them, a list of options appears as to what we can do with them. Spirits have four abilities. The basic one is that they can turn into a cloud, spewing wind out of their mouths, thus creating a wind stream. Wind streams are the pretty much everywhere in the game, and are the primary method of transportation, since spirits can float along their path. Since they are so important, it makes sense that spirits also have an ability to block a stream by transforming into a huge round barrier. Apart from what we can do with wind, spirits can also grow, creating a branch bridge out of themselves. Finally, spirits can dig, making holes in the map. All of the above abilities consume a spirit, which means that you need to be careful in order to have enough spirits left in the end to fulfill the level’s quota. Moreover, when you click a spirit to initiate an ability, the game doesn’t pause. Every other spirit keeps moving. This means that there are many cases in the game where timing and precision are required. Apart from the fairly standard gameplay, the game also offers some very relaxing and soothing music. Combined with the game’s black and white artstyle and its “lazy” animation, Spirits as a whole offers a very calm experience, allowing you to spend your in-game time in peace. This peace might be disturbed quite a bit if you are a perfectionist. While I was playing through the game, my main goal was to get through the stages, see what is different in each one and experience all the abilities I had. This meant that I usually didn’t finish a level in the perfect way, that is, having as many spirits alive as possible. When I went back to try that in a few levels, I was quickly frustrated. Firstly, the game forces you to really think a level through if you want to perfect it, which is of course very good game design. What mars it however, is the fact that the game, either by design or by glitch is way too accurate in some things. For example, placing a cloud just a few clicks away from the right place means failure. Also, sometimes, for unknown reasons, blocking or creating wind streams is a bit unpredictable, mostly with the range of the stream. These factors will force you into quite a few restarts. While this is not that major in the early game, when you get further into Spirits and the levels get bigger and bigger, it starts to become an issue. Apart from that, the game doesn’t really have much else, both in terms of issues but also in terms of positives. 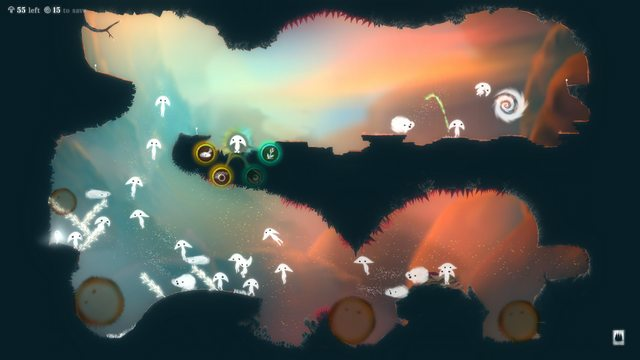 Essentially, Spirits is a slightly different take on the Lemmings formula. If you liked Lemmings, you will certainly like Spirits. If, on the other hand, you have never played Lemmings and want a simple relaxing game to spend a few evenings on, this could be it. Spirits is available through Steam for 9 euros. Spirits uses the Lemmings formula to good effect, creating a game with a different look and identity but similar enough that you will instantly understand it. If you liked Lemmings and want something close to that or you want an easy simplistic game to play, Spirits will serve both of those wants equally. + Relaxing music and beautiful artstyle. – Some bugs and glitches when it comes to precision. Spitkiss, letters of love covered spit?